We all know that education is very important now, AJK is a self-governing state under the Federation of Pakistan, The capital city of AJK is Muzaffarabad where most people are employed and very few are not getting jobs. Muzaffarabad is the richest district of Pakistan announced by Planning Commission of Pakistan. Mostly, People are doing jobs in the education department, education minister is Syed barrister Iftikhar Gillani. Govt. 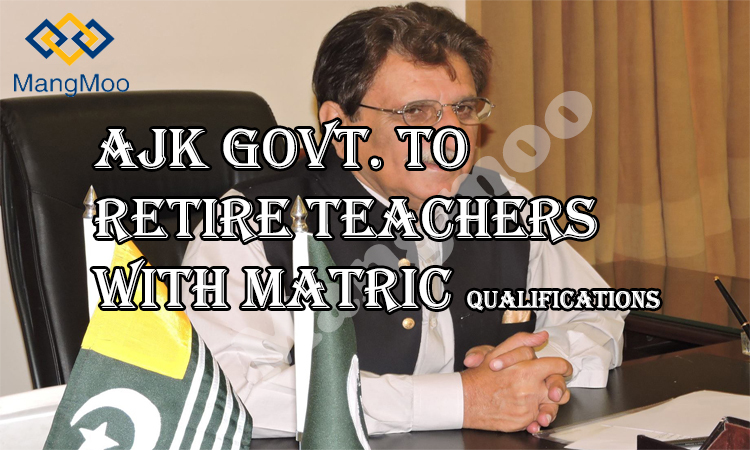 announced that those teachers who are matric passed will be retired from 30th April. we all know that education is very important for all of us and we need teachers that are experts and well-qualified. So Govt. think that now education needs those teachers who are well-qualified, and who have experienced, So Govt is giving retirements to those teachers who are matric passed. and this process will start from 30th April also they retired with full benefits of pensions if they have completed service of 25. All the male and female whose qualification is matric with PTC/Diploma are not accepted from now and will be retired from 30th April. Official Notification “All those primary or junior teachers, whose qualification is matric or matric with PTC/Technical diploma, and (thus) do not fulfil the qualifications and conditions in education policy and departmental rules, will stand retired on April 30 with full pension benefits, if they have completed qualifying service of 25 years by then,” stated a notification issued by the Elementary and Secondary Education Secretariat.